It’s summertime, which equals us spending a ton of time in the garden. I try to avoid the hottest times of day to be out there, so I’m usually waking up early, grabbing a quick cup of coffee, and then running outside to do a little weeding, planting, and checking on things. In the evenings, just as the sun’s about to set, I’m back out there, doing the same thing. Morning comes, we repeat. We eat a lot of our meals outside, too (if the bugs aren’t too bad). We throw something easy on the grill, make a quick salad, and eat at our little patio table. There’s just something about it that’s good for the soul after a long winter of hibernating. This time of year also brings the frantic rush to get everything we grow eaten, preserved, or shared. And one plant that’s always in overdrive? Sage. It grows into huge bushes, flowering with the prettiest purple flowers and then giving us the best herbs all through the year. I try to use it up in different ways and dry some to gift to friends. Today I made a quick infused grapefruit & sage syrup, then made myself a little non-alcoholic mocktail with it to enjoy while we’re on the deck, waiting for dinner to cook. It’s easy and fresh and very hydrating, and when I salt-rim the glasses, it *almost* reminds me of a seasonal margarita. I’m calling it a Grapefruit Sage Sparkler, but I almost called it a Grapefruit Sage Mock-arita. Which would you prefer? 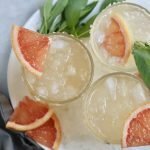 A fruity & herbaceous mocktail compliant for Whole30! Cut the a grapefruit in half and run one piece along the edge of each glass. Pour sea salt in a shallow dish and dip each glass in. Juice two grapefruits. Bring the juice to a simmer in a small pan. Add 4-5 sage leaves and simmer together for about 5 minutes (or until reduced by about a third). Remove the leaves and chill in the refrigerator. Divide the juice between 4 glasses. Add crushed ice to each glass until 3/4 full. 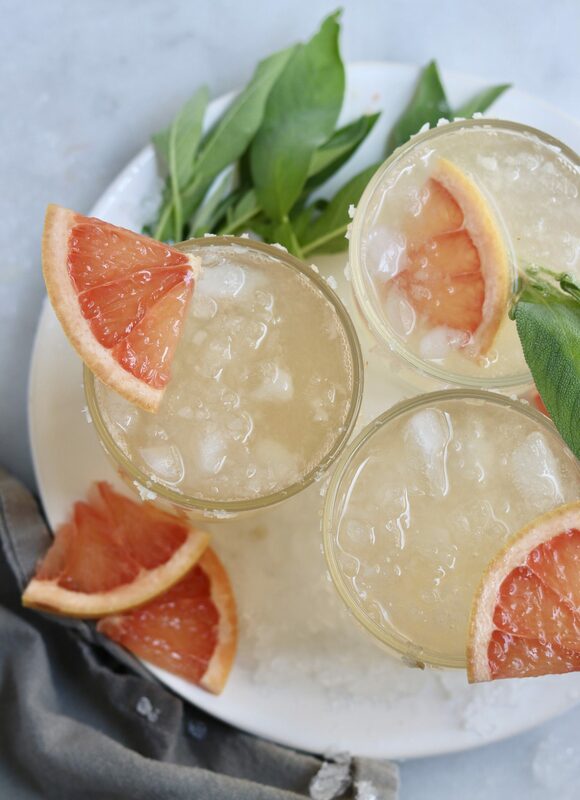 Top off with grapefruit Lacroix for a little sparkle! I get my lemon zest salt from Jacobsen Salt Co. It’s absolutely delicious & fabulous in cooked dishes as well! Check out some of my other summertime recipes, like this Boozy-Fruity Arnold Palmer or my Coconut Mojito Mocktail!